New Monthly Event Will Offer Wine, Appetizers and a Walk-Thru of the Exhibit "ASF: Ending the Epidemic"
IRVINE, CA--(Marketwired - May 16, 2017) - AIDS Services Foundation Orange County (ASF) is pleased to announce a new monthly event that will take place every fourth Tuesday at 6 p.m. at the ASF headquarters in Irvine, Calif. (17982 Sky Park Circle, Ste J) starting on May 23rd. A lovely hour complete with wine and light hors d'oeuvres, attendees will have the opportunity to walk through and experience the nonprofit's newest exhibit: "ASF: Ending the Epidemic," a moving display that outlines the history of HIV/AIDS in Orange County as well as ASF's goals for the future. "I invite and encourage everyone to come to our monthly Triumph Tuesday events," said Philip Yaeger, ASF's executive director and CEO. "Triumph Tuesday is a fun way for ASF supporters and guests to get a comprehensive view of our organization and learn about how ASF began, where we are going and how you can help us end the epidemic! Not to mention, you'll get to mingle with other likeminded individuals around wine and hors d'oeuvres." Founded in 1985 by a small group of volunteers who saw a need to help those around them suffering and dying of AIDS with nowhere to turn, ASF is now the largest and most comprehensive nonprofit AIDS service organization in Orange County, with a staff of about 60 committed and caring individuals, a 21-member board of directors and hundreds of volunteers. Services include food, transportation, housing, emergency financial assistance, kids and family programs, mental health counseling, support groups and HIV education and prevention services. ASF's mission is to end the AIDS epidemic for men, women and children in Orange County through HIV prevention, and linkage to care and treatment, while eliminating the stigma of AIDS. 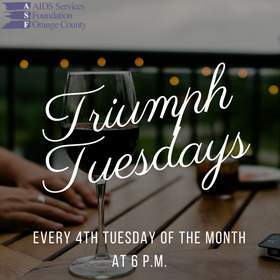 All are invited to attend Triumph Tuesdays and learn more about the organization and how they can help put an end to AIDS. For more information about Triumph Tuesday, visit http://www.ocasf.org/triumphtuesday.html. To RSVP, email Chance McKee at cmckee@ocasf.org. With media inquiries, please contact Leslie Licano at 949.733.8679 ext. 101.